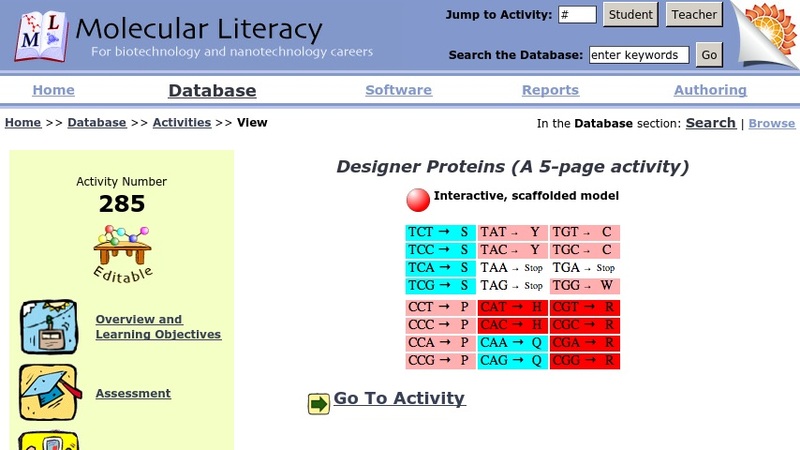 In this activity, by the Concord Consortium's Molecular Literacy project, students will "design proteins from scratch by writing [their] own DNA sequence." This interactive puzzle will challenge students with entertaining games along with quizzes throughout the program. The activity itself is a java-based interactive resource built upon the free, open source Molecular Workbench software. In addition, visitors will find an overview of the activity, assessments, and concepts and their correlation to AAAS and NSES standards.